Most of the Quietways are on streets where there is little or relatively little traffic. But we are suggesting some of the busier secondary streets, where there is heavy cycle demand, are closed or restricted to through-traffic to make them more cycle-friendly. Camden is currently investigating this for Tavistock Place and Torrington Place in Bloomsbury – already a very popular and overcrowded cycle route. The map below is an extract from the map published by TfL on 18th Dec 2013; showing the GRID routes in Camden with some of the names of the roads added. and others (solve problem at SE corner Russell Square and two way cycling in Southampton Place). These are timetabled for delivery before September 2014. Bloomsbury Way, Theobalds Road: the most cycled route in London. From the end of January, cyclists will be able to use the contraflow bus lane in Bloomsbury Way, but that’s only a start. See VoleO’speed’s recent blog on the ‘Holborn trap’. Come to our meeting on 20th January to hear a presentation by Andrea Casalotti who is leading a campaign for a ‘Clerkenwell Boulevard‘ on this alignment. Delancey-Pratt: is a main east-west desire line across Camden Town and also forms part of the canal alternative route. Goodsway is a vital cross link in many other routes; the junctions require radical changes, particularly those at either end of the tunnel under the railway lines. Royal College Street route further two-way extension down Midland Road, across Euston Road and into Judd Street. Junction at Delancey/Parkway/Prince Albert Road/Albany Street/Gloucester Gate. Major redesign to allow two way cycling on all branches. In the days immediately after the publication of the CLCG, some Tweeters were complaining that the CLCG doesn’t include the major E-W routes such as Euston Road, New Oxford Street and the Strand. And others grumbled that nothing that the only coherent E-W route across central London (Tavistock Place) is something that was built over a decade ago and is already over capacity. They ignored the detail (quoted above) that the plan is to create a cycle street in Tavistock Place/Torrington Place, which will initially shift some of the rat running motors into Euston Road. 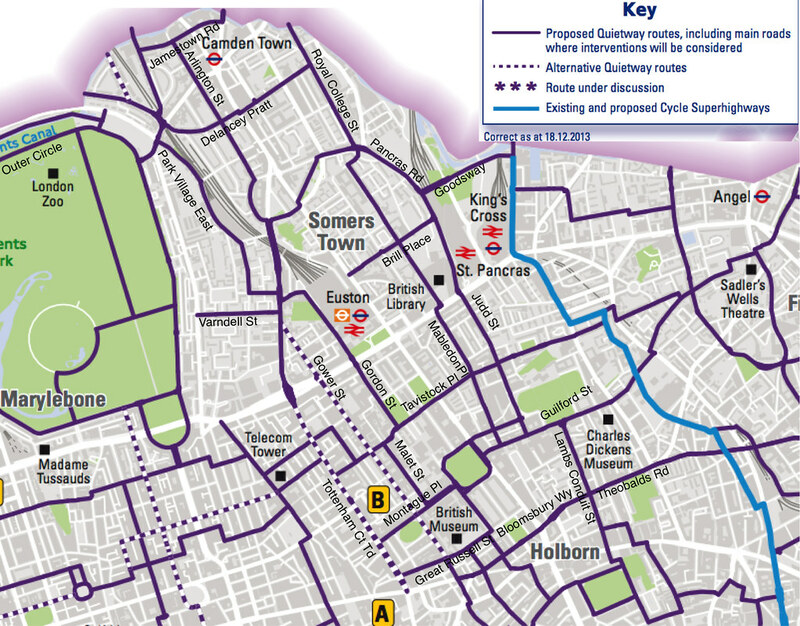 A route on Euston Road would be a Cycling Super Highway with segregated infrastructure, which so far TfL has failed to implement safely – we are in discussions about CS11 on Finchley Road/Avenue Road but it’s early days. Although Euston Road is very direct for some journeys there are numerous traffic signals and even with segregated space for cyclists, the noise and pollution would remain. Some tweeters were pessimistic: saying ‘nothing will be done’. But I believe that if we can create local support for removal of rat running motors from Tavistock Place and Bloomsbury Way-Theobalds Road we could end up with some streets that really are for cycling. We already have evidence in Royal College Street that Camden Council is very keen to push forward with excellent cycling schemes. The GRID announcement is also a consultation and we’ll need to reply by February. See our response from January 2014. **Have a look at the video video of Groningen at http://vimeo.com/76207227 which shows how to reduce rat running in local streets and hence improve neighbourhoods.